Last year's Donald Trump piñata. Trump is scary even in piñata form. 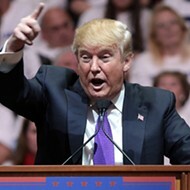 Most of us have dreamed of smacking Donald Trump over the head at one time or another — and those who say they haven't are likely lying. But who knew that dream could actually come true? 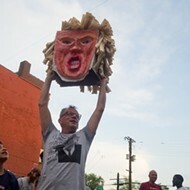 In anticipation of Cinco De Mayo, St. Louis restaurateur and artist Francis Rodriguez will unveil a giant Donald Trump piñata at his Yaquis Pizza and Wine Bar (2728 Cherokee) tomorrow at 7 p.m. 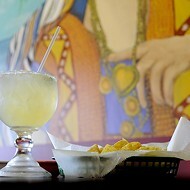 Complete with a golden throne, the "El Trumpo Piñata" will grace the restaurant until the Cinco de Mayo celebration on May 7, when it will make an appearance in the neighborhood parade on Cherokee at 1 p.m. Later that day, it will be moved to the main stage located next to Yaquis. And then we get to the good part. 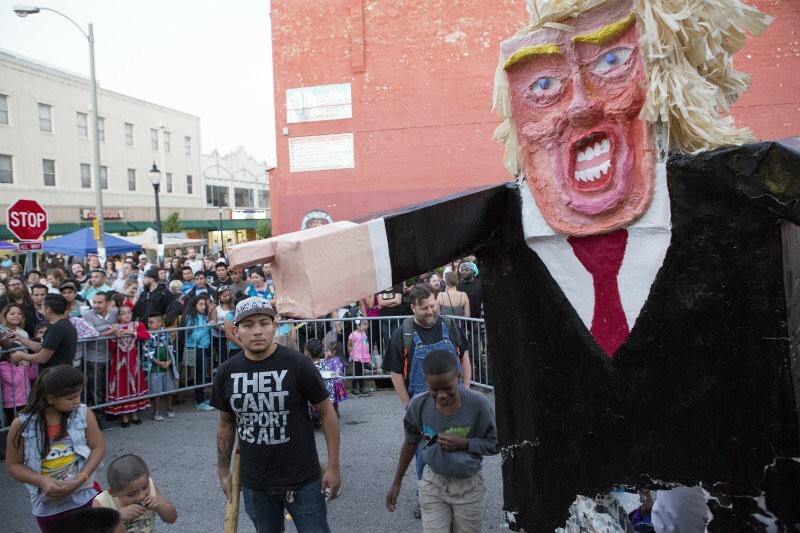 At dusk (approximately 9 p.m.) on May 7, kids will be invited to battle the piñata — and collect the candy that falls out as Trump's head gets bashed to bits. 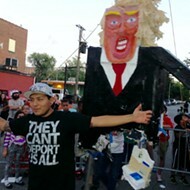 This isn't Rodriguez's first Trump piñata. 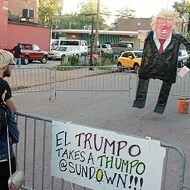 Using the tagline "El Trumpo Takes a Thumpo," Rodriguez and a few local artists spent a week in the Yaquis basement in August 2015 bringing a previous piñata to life. About 1,000 people gathered to watch during a Mexican Independence Day celebration as neighborhood kids took down the political candidate in all his paper mache glory. The second-generation Drumpf piñata will be even bigger and better, measuring 10 feet high and 5.5 feet wide. 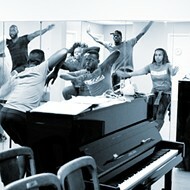 Several artists have contributed to its creation. Oh, and did we mention that the entire piñata is made out of old copies of the RFT? And while it's thrilling to watch Donald Trump get the spanking he deserves, Rodriguez says it's not all fun and games. After all, nothing brings people together quite like a shared loathing for Donald Trump. Editor's note: We updated this story after publication to take away one detail and add another.